The speed is all the more impressive because he has another film, Ready Player One, in post-production, and a third, The Kidnapping of Edgardo Mortara, ready to start shooting. In fact, the latter had to be put on hold, Spielberg said, because “we couldn’t find a six-year-old to play Edgardo after looking for a year.” He just lifted his faithful crew out of Edgardo and dropped them into The Post. 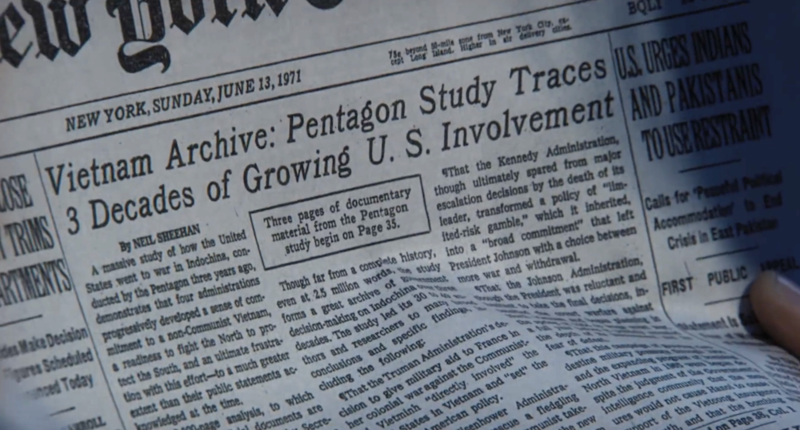 In 1971, a mass of documents—they came to be known as the Pentagon Papers—were leaked to The New York Times. They revealed lies and a cover-up about the military’s assessment that America was losing the Vietnam War. Nixon’s lawyers gagged the NYT, but then The Washington Post got hold of the papers and published them, as, subsequently, did most of the press in the land. The papers won. The Washington Post is the hero of this story, a fact that has annoyed some people at the NYT. This is not fair. The part of The New York Times is fully credited, and, in any case, the Post had much the more significant story. It was the underdog paper fighting for survival. Also, it was owned by a woman, Katharine Graham, who had to choose between backing down to the legal threat or publishing the papers—either choice could have destroyed the Post, and the latter could have had Graham and her editor imprisoned. He started the film “way before women came forward with multiple accusations of misconduct by multiple men.” The Trump-Nixon link was planned; the condition of women at work was serendipitous. 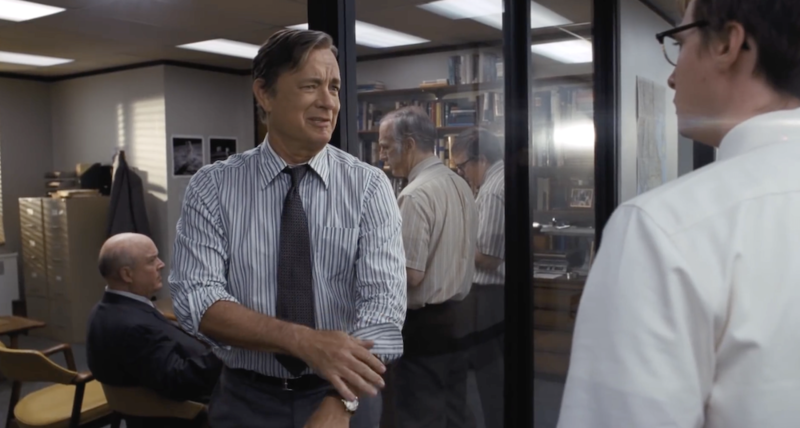 This is a political thriller, his first, he said; he classified Bridge of Spies as a spy thriller. He likes embracing a new genre because he gets all his best ideas when he isn’t quite sure what he is doing and there’s an edge of panic. Anyway, here we are at the Mandarin Oriental in snowbound New York. It’s my third interview with him in 15 years, and my three basic impressions of the man are unchanged: he speaks in almost-impossible-to-cut extended paragraphs; his clothes are always casual but very buttoned up, as if he is containing himself (this time, a buttoned jacket with a neat scarf to protect against the snow outside); and, finally, he is probably the nicest powerful man I have ever interviewed. He always speaks freely, unencumbered by nervous PRs, but on this occasion he did what he has never done before—he censored the conversation. We were talking about Jewishness, and I asked him about Trump’s recognition of Jerusalem as the capital of Israel. He has strong views, he said, but he didn’t want to “derail this interview” so that the big story coming out of it was not his film, but Trump and Jerusalem. Fair enough. One thing that is unavoidable in any interview with Spielberg is family. His parents divorced while he was still at school, and so many of his films—Close Encounters, ET, even Bridge of Spies—seem to be about the reconstruction or salvation of a family. Even when it is not explicit, the theme is there. 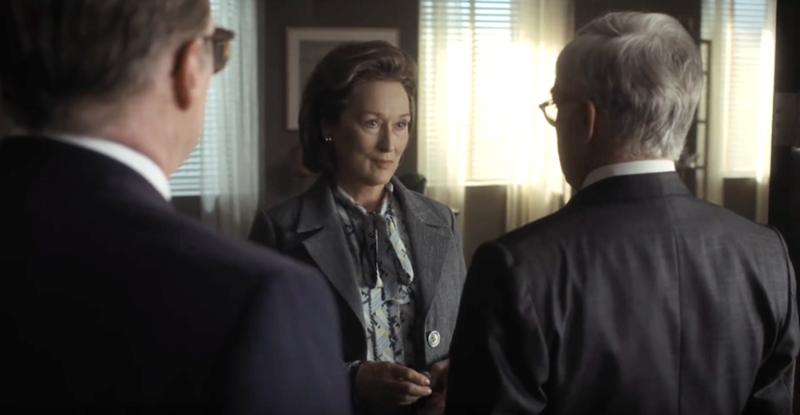 In The Post, Graham (Meryl Streep) and the Post’s editor, Ben Bradlee (Tom Hanks), act as the conflicted parents of a bunch of fractious children, the reporters. His mother, Leah, died in February last year. She was 97. Almost to the end, she kept running her Milky Way kosher restaurant in Los Angeles. His father, Arnold, is now 100. 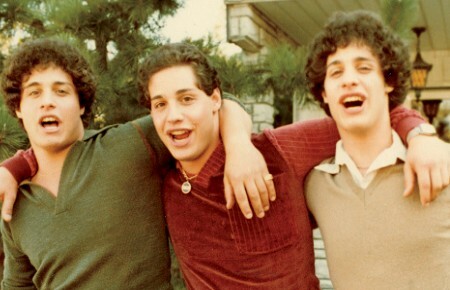 The family as a whole seems to be triumphantly intact. He said he has never been in therapy—why bother talking to a stranger? He has seven children—one from his earlier marriage to Amy Irving, one from his second wife Kate Capshaw’s previous marriage, two adoptees and three of their own—plus four grandchildren. I ask him if any of them have ever told him he’s made a crap movie. 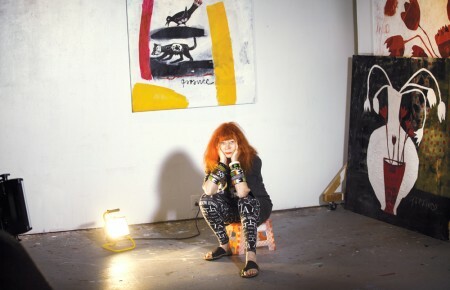 The significance of all this is not merely biographical, it is aesthetic. Spielberg collects the paintings of Norman Rockwell, who conjured up a kind, sweet, brave, idealized vision of America and its families. Like Rockwell, he believes in his family, his country and its founding role as the harbinger of a better world. This, combined with his liberal belief in progress, means he is not always content merely to show, but to tell. He sometimes tags an explicit moral onto the end of his films—the second inaugural address in Lincoln or the children of survivors laying stones on the monument in Schindler’s List. He was certainly standing on his heels throughout, notably with his two stars. 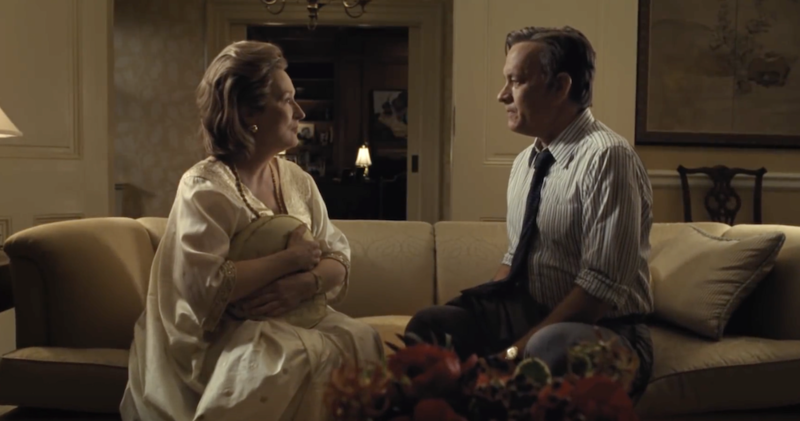 There’s an early scene in which Hanks and Streep are having breakfast in a wood-paneled room. This is the first film in which they have appeared together. Really? But the scene is also odd because it is so un-Spielberg. From Jaws on, he made his name with astonishing camera movements—Hitchcock called him “the first one of us who doesn’t see the proscenium arch”—but this scene is static. Anyway, here’s to our next interview, whenever, wherever. I’ll just close this one with one of his paragraphs, long, uneditable and, for any good ol’ hack, thrilling. Katharine Graham went on to steer The Washington Post through the greatest political scoop of the era, Watergate—which led to the resignation of President Nixon. She gave up the title of publisher in 1979 and of chairwoman in 1991. She died in 2001, aged 84, having become the most distinguished figure in American journalism. Last month, one of her four children, William, killed himself, a terrible reprise of the suicide of her husband, Philip, in 1963, which led to her taking over the Post. Ben Bradlee, the paper’s executive editor, also stepped down in 1991. He died, aged 93, in 2014. Having masterminded two of the greatest stories of his time, he was awarded the Legion of Honour in France, and the Presidential Medal of Freedom by Barack Obama. He remains a secular saint to liberal America, the man who showed what the press could do. Daniel Ellsberg, the leaker of the Pentagon Papers, was hit with multiple charges under the Espionage Act that could have led to a life sentence, but, thanks to government incompetence and a superb defense team, all the charges were dismissed in 1973. He is 86, and his activism has continued—challenging the Iraq War decision by warning of another Vietnam, and now publishing a book exposing weaknesses in America’s nuclear-weapons control. The Washington Post was sold by the Graham family in 2013 to Jeff Bezos, the founder of Amazon, for $250m. The Bezos stewardship is being watched closely.